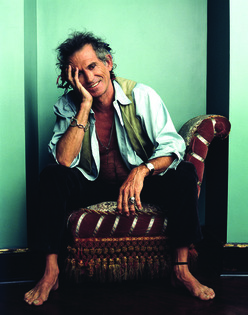 Keith Richards is an English guitarist, songwriter, singer, producer and founding member of The Rolling Stones. As a guitarist Richards is mostly known for his innovative rhythm playing. In 2003 Richards was ranked 10th on Rolling Stone magazine's "100 Greatest Guitarists of All Time".With songwriting partner and Rolling Stones lead vocalist Mick Jagger, Richards has written and recorded hundreds of songs, fourteen of which Rolling Stone magazine lists among the "500 Greatest Songs of All Time".